Hawaii's Sunny Garcia advanced to the round of 32 yesterday at the O'Neill World Cup of Surfing at Sunset Beach with a narrow victory over Phil MacDonald of Australia. The sports catchphrase "survive and advance" has become the monumental task facing competitors in the O'Neill World Cup of Surfing at Sunset Beach. For the second time in three days, surfers in the contest that serves as the second jewel of the Vans Triple Crown of Surfing series and season finale for the World Qualifying Series braved monstrous and potentially lethal surf yesterday at the famed North Shore spot before officials decided to call a halt to the competition because the waves had grown too big and unruly. The last eight heats of the third round were completed yesterday in waves with faces that regularly reached Sunset's maximum contestable point of about 25 feet and that rolled in without a distinct lineup. One more full day of competition is needed by Thursday to complete the second of three major Hawaii contests that make up the Triple Crown series. "It's all about survival," said the North Shore's T.J. Barron, after winning the last heat of the day and eliminating defending World Cup champion Joel Parkinson (Australia) in the process. "That was one of the hardest heats I've ever had. I'm glad I didn't break a board and didn't get held under too long. I was really scared a few times, and I got my board blown out of my hands, lost a lot of breath. But you've got to try to hold on to your board and make sure it brings you back up." "Time was running out (in the heat), and I was getting tired," he added. "I was just hoping I could catch a wave and not black out." After tallying a mere 9.90 (out of 20) total points for his top two waves because of the conditions to take the heat, the 21-year-old Barron now has a spot among the final 32 surfers in the event and the slim shot of qualifying for next year's elite World Championship Tour reserved for the world's top 45 surfers should he win the contest that also serves as the WQS finale. Also advancing to the final 32 and still in contention for the Triple Crown championship that goes to the top overall performer in the series was Hawaii's Sunny Garcia -- the former two-time winner of the World Cup and record six-time Triple Crown overall champ. Among the strongest and sturdiest of the world's best surfers at around 6-foot and 200 pounds, even Garcia appeared at times to have the impact of a toothpick in the huge waves. 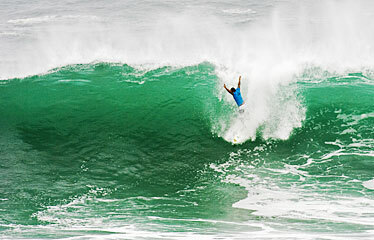 But he managed to take his third-rounder with the day's lowest winning total of 8.83 points for his top two waves. With only three days remaining to complete the World Cup, and conditions predicted to go down some size-wise but deteriorate with unfavorable winds, Triple Crown officials felt compelled to go forward with the half-day in the heaving surf. They ran the first half of the third round in similar conditions on Saturday, and Garcia wasn't restrained in expressing his dislike for the situation. "I'm not going to hide my disappointment with the guys running the contest today, Garcia said. "To send us out in these kinds of conditions is ridiculous. We're gonna go out and surf, like dummies, it's hard. There's no channel and it's dangerous. I'm happy I made my heat, but I'm pretty displeased that the surfers don't have more say. I know the waves are going to get smaller and the wind is going to get bad, but on a day like this I would be more concerned with losing somebody in these kinds of conditions." Among those also surfing yesterday and advancing to the World Cup's final day were: world No. 2 Taj Burrow (Australia), No. 8 Jeremy Flores (France), Tiago Pires (Portugal) and 2006 World Cup runner-up Jordy Smith (South Africa). There are four other Hawaii surfers among the final 32 besides Barron and Garcia. They are: Makua Rothman, Flynn Novak, Ian Walsh and Bruce Irons. Irons' older brother, Andy Irons -- the two-time defending Triple Crown overall champ, was eliminated from the World Cup on Saturday and contention for this year's series title after he failed to show for his third-round heat.